Clyde: There's got to be another way. Billy: Yeah, there's got to be another way. You've got to do it." 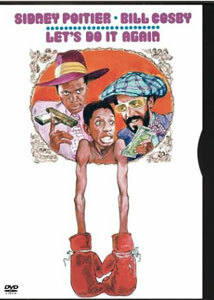 This is not necessarily a traditional sequel, rather Let's Do It Again (1975) is more of a "same actors playing similar characters" kind of film, with Bill Cosby and Sidney Poitier once again starring together in the second installment of an unofficial trilogy; the first being Uptown Saturday Night in 1974, and the third being A Piece of the Action in 1977, with all three having been directed by Poitier. The premise in all three films are quite similar, in that Cosby and Poitier are friends who get involved in some crazy situation with some equally crazy criminals, and all are populated by a wonderfully large ensemble cast of familiar, talented black actors. Poitier released these during the tail end of the "blaxploitation" era, and likely for many filmgoers of that time, that is what they were, but it is really unfair to lump these films into that category. In reality, all three are simply enjoyable and fun comedies. Let's Do It Again features Billy Foster (Cosby) and Clyde Williams (Poitier) as a couple of Atlanta working stiffs (one delivers milk, one drives a forklift) who concoct a daring plan to raise $50,000 to save The Shaka Lodge, a club that is the cornerstone of their neighborhood. The lodge is on the verge of being torn down when the pair come up with the idea to travel to New Orleans to place a huge bet on an underdog boxer named Bootney Farnsworth (Jimmie Walker), who is morphed into a super fighter via Clyde's hypnotic abilities. Everything looks well and good until their plans get muddied when they double cross a couple of rival crime bosses, Kansas City Mack (John Amos) and Biggie Smalls (Calvin Lockhart). Throughout the film, Poitier plays the exasperated straight man to Cosby, who is all gloriously loose-limbed and rubbery beneath a shifty and nappy looking beard. While Poitier gets to deliver an occasional bit of comedy, which on him seems even funnier than it should be, he widely sidesteps and allows Cosby to take over and do what he does so well. Cosby's Billy is the mastermind, the one who eventually convinces the reluctant Clyde to use his hypnotic powers, and it is Billy who gets to be front and center for most of the film's finer comic moments, which according to screenwriter Richard Wesley on the accompanying commentary track, many of which were pure improvisation. It is the things that can't be scripted, like watching a jittery Cosby, in a garish orange suit and wraparound shades, trying to look dangerous while placing a bet with Kansas City Mack, all the while fumbling with a gun, that are some of Let's Do It Again better scenes, and they are truly laugh-out-loud funny. Poitier has assembled a terrific cast of familiar faces (Walker, Amos, Lockhart, Mel Stewart, Denise Nicholas, Ossie Davis, Val Avery, George Foreman), and all contribute fun, watchable performances in a film that unfortunately gets a little lost along the way during the final act. The likeable and very human leads get thrust into a sometimes silly slapstick chase that makes the scenario more broad and unnatural, with bumbling criminals and disguises being the order of the day. While Uptown Saturday Night remained a bit more steadfast, storywise, this one slips a little near the end, and though the characters played by Cosby and Poitier seem like very real people, the presentation of the cartoon-ish criminals seemed a little over the top at times. Screenplay speed bumps aside, Let's Do It Again is a largely likeable comedy that provides numerous laughs without having to resort to any profanity (though a restaurant scene with Cosby and movie wife Denise Nicholas offers up some decidedly funny sexual double entendres). The Curtis Mayfield score, along with the soulful vocals of The Staple Singers, gives the whole thing a wah-wah-filled mellifluous groove that pleasantly compliments the often broad comedic onscreen antics. The three films that make up the Poitier-directed so-called Uptown trilogy oddly enough were never as mainstream as was 1980's Stir Crazy (also directed by Poitier), which starred Gene Wilder and Richard Pryor essentially doing the same kind of schtick. These films pre-dated the onslaught of the resurgence of the "buddy film" genre, and they still hold up as pretty entertaining family titles, thanks in no small part to the talents of Cosby and Poitier. Image Transfer Review: The 1.85:1 anamorphic widescreen transfer looks darn good, especially considering the age of the film. Solid color reproduction (check out those colorful suits) and strong black levels don't date this as a mid-1970s film, and overall I was rather impressed at the depth and brightness of the colors. The source print exhibited a bit of frequent white specks that were the only major detriment in an otherwise good-looking transfer. Audio Transfer Review: A rather straightforward English mono track is the sole audio choice. This track sounds a bit fuller than a lot of comparable era mono tracks, with dialogue coming across perfectly clear and understandable, and the joys of the Curtis Mayfield wah-wah score sounding absolutely peachy. Extras Review: Screenwriter Richard Wesley and New York Press film critic Armond White deliver the only extra on this disc, a full-length, scene-specific commentary. This isn't really a film that begs for too much of an in-depth analysis, with really only a Poitier/Cosby track seeming like something that would have been truly special. Wesley, however, talks succinctly about writing, and the melding of scripted and improv sequences, while critic White seems to focus too much on the quasi-serious side, and seems content to concern himself with his perception of the film and its impact within the black community. Is it wrong that I don't look at this a "black" film, but rather simply as a comedy? The disc is cut into 29 chapters, and includes subtitles in English, French and Spanish. Not as tight as Uptown Saturday Night, this second pairing of Cosby and Poitier is still full of some terrific comic moments. You are pretty much be certain that anytime Cosby is onscreen there is bound to be something to make you laugh, and that is the case here.